Sometimes I love being an instructor. 2 weeks of Optimize and Scale and finally I have more valid and realistic values from 2 participants of mine regarding performance vs. power usage. First of all thanks to Thomas Bröcker and Alexander Ganser who were not just discussing this topic with me, but also did this experiment in their environment. First of all I am proud that it seems that I have motivated Alexander to blog about his findings in English :-). While he is focusing in his post on hosting server applications on Dell/Fujitsu hardware (-> please have a look at it), I will extent this information by using data from a HP-based VDI environment, where the impact on performance, power-usage and costs were much higher than I have expected it. The trend of green IT not just had an effect on more effective consumer CPUs, it is also getting more and more a trend in modern datacenters. Hosts are powered down and on automatically (DPM – productive users of this feature please contact me 😉 ), CPU frequencies are dynamically changed or cores are disabled on demand (core parking). Since I always recommend NOT to use any power management features in a server environment, I am now following up this topic by giving suitable and realistic numbers from a production environment. A few details about the setup and the scenario I am going to talk about. For my calculations later on I selected a common VDI size of around 1000 Windows 7 virtual machines. 1st dimension: Sizing of a virtual machine (is the virtual hardware enough for the proposed workload?) – verified by check if the end-user satisfied with the performance (embedded videos are working fluently). 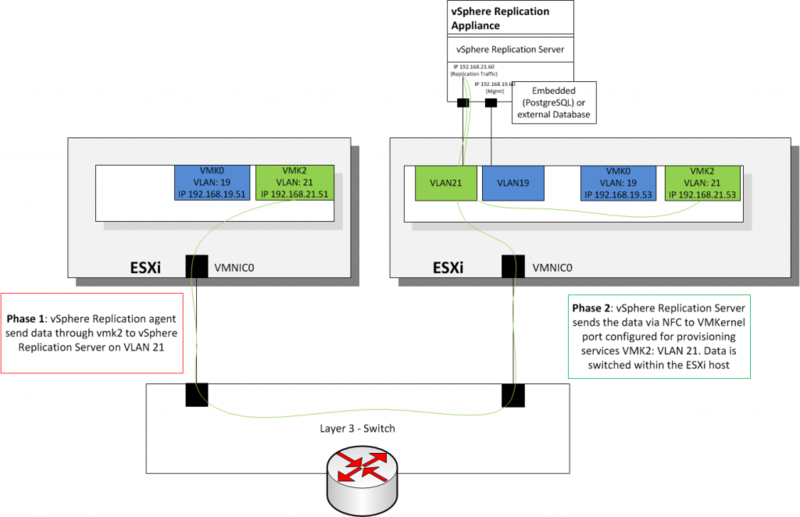 2nd dimension: Sharing of resources (how much contention can we tolerate when multiple virtual hardware instances (vCPU) shares the physical hardware (Cores) – verified by defining thresholds for specific ESXi metrics. // * of course we would run into a resource-contention once each user on this ESXi host is going to watch a video within the virtual desktop resulting a much higher %rdy value. So far so good. The following parameters describe dependant variables for the power costs of such an environment. Of course the used metrics can differ between countries (price for energy) and datacenter type (cooling). Climate factor: A metric defining how much power is effort to cool down the IT systems within a datacenter. This varies a lot for different datacenter and I am referring as a source to Centron who did an analysis in German with an outcome that the factor is between 1,3 and 1,5 which means that for 100 Watt used by a component we need 30/50 Watt for the cooling energy. The value I will take is randomly taken as 1,5 and can differ a lot in each datacenter. Data was collected during a workday at around 11 AM – Friday. We assume that the data is taken during a regular office-hour workload. The result of the power-saving mode is very high/aggressive in a VDI environment and is far less when the ESXi host is used for server virtualization (I refer back to the blog post of Alexander Ganser since we observed nearly the same numbers for our serers). Server virtualization has a higher constant CPU-load while VDI workload pattern is much more infrequent and gives a CPU more chances to quiesce-down a little bit. We observed around 10% power-savings in the server field. So now let’s get a step ahead and compare the influence of the energy-saving mode for the performance. As you can see the power usage has a direct impact on the ready values of our virtual machines vCPU. At the end of the day the power-savings have a little financial impact in the VDI field, still I always recommend deactivating ALL power-saving methods since I always try to ensure the highest performance. Especially in the VDI field with irregular sudden CPU spikes the wake-up / clock-increasement of the Core takes too much time and if you read through the VMware community on a regular basis you will see that a lot of strange symptoms are very often resolved by disabling energy-saving mechanisms. Please be aware that those numbers may differ in your environment depending on your server, climate-factor, consolidation-rate, etc. The first step of reconfigure virtual machine showed up in vCenter right after we triggered the vApp power on in vCloud Director. From then it took around 5min to reach step two. Once step 2 was completed, the stack paused for another 10min before the VM was actually powered on. This even seemed to have implications on vCenter Orchestrator including timeouts and failed workflows. We spent an entire day on trying to track the problem down and came up with the opinion that it had to be inside vCloud Director. But before we went into log files, message queues etc, we decided to simply reboot the entire stack: BINGO! After the reboot the problem vanished. I remember reading the paper “Virtualizing Performance Counters” by Benjamin Serebrin and Daniel Hecht some time ago. I guess that was when I was researching for the other article about selecting the MMU virtualization mode. At the time, I was wondering “when will virtual hardware performance counters be implemented?” and now here we are: 5.1 supports it. In this post, I would like to give you some information on how to use virtual hardware performance counters and how you can use them to more easily make the decision on the VMM mode. Hardware Performance Counters – often refered to as PMC (performance monitoring counters) describe a set of special-purpose registers a physical CPU provides in order to facilitate the counting of low level, hardware-related events that occur inside the CPU. Giving deep insight into CPU activity, PMCs are usually utilized by profilers. In VMware virtual machines until now, the VMM did not emulate PMC for vCPUs rendering profilers in VMs useless in a lot of scenarios. 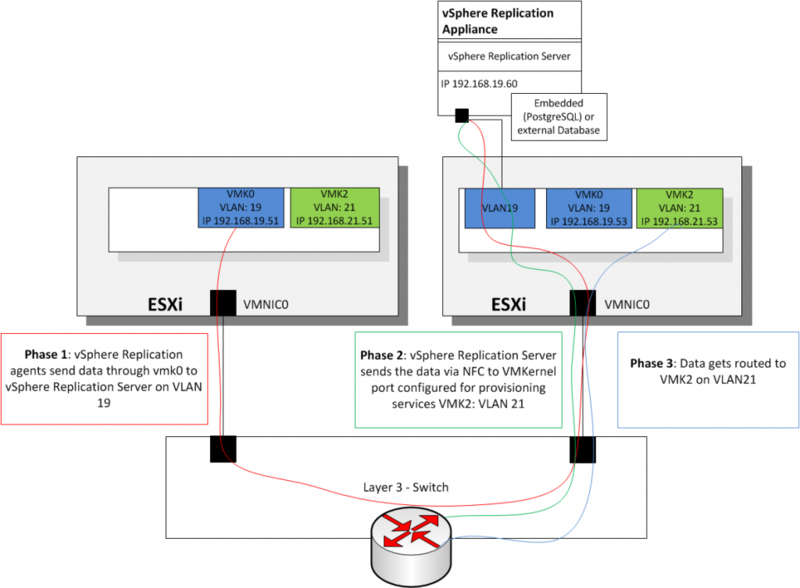 With ESXi 5.1 VMware eradicated this flaw introducing vPMC. For those technical folks out there, I recommend reading the paper mentioned above. It will give you good insight into implications and challenges that go along with the technology. enable vPMC in vSphere Web Client (it does not show in vSphere Client!). Enabling vPMC for a VM enables further sanity checks before moving that VM with vMotion. The target host must support the same PMCs, too, otherwise no vMotion will be possible. by the hypervisor on behalf of the guest. The freeze mode defines which hardware events should be accounted for in which of the above situations. guest: In this mode, events increment during direct guest execution only. hybrid: Events counting the number of instructions and branches are handled as if in guest freeze mode. Otherwise, vcpu freeze mode behavior is used. If you wish to change that behavior, set the vpmc.freezeMode option to “hybrid”, “guest” or “vcpu” (hybrid is default). where EVENT is the name of the event as listed in “perf list” and COMMAND is command to execute to create the process to monitor. 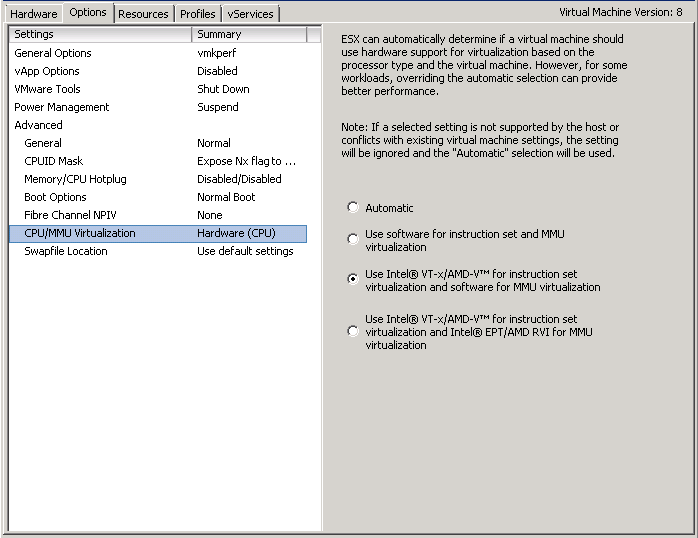 Recently, I posted an article about selecting the proper MMU virtualization mode for a certain application. It suggested to conduct an isolated experiment with the VM in question and to use vmkperf to monitor the number of TLB misses. This procedure is quite cumbersome as “isolated experiment” means to set up a dedicated ESXi host with a single VM and the application to monitor just for the testing, which might not even be possible if the application is already running productively. The script executed is the same one already used in the other article, but this time we measure the TLB miss count from within the VM using perf. The results show the same: a much higher number of TLB misses using nested paging. The consequences of this were already explained in the other article. 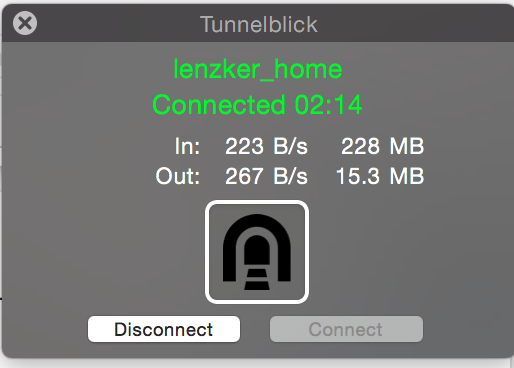 Thank you, Thomas Glanzmann, for providing recent hardware to test this new feature! This information is not really new and also well documented by VMware, but nevertheless I meet a lot of people with a VMware View environment not aware of the following. Since it took me some time to find the specific part in the documentation, I decided to write a short article here. Important: Changing the registry values for the jvm heap size is NOT recommended. Since the Connection Server 5.1 is only supported on Windows Server 2008 R2, which in turn is only available in a 64-bit version this is something administrator need to take care of, once they decide to raise the amount of the connection server memory. Reinstalling the connection server is especially important crossing the 10GB memory threshold. This will increase the JVM heap siz to 1024MB which allows the connection server to handle up to 2000 connections. Selecting nested paging for MMU is not always the best choice depending on the memory workload inside the guest OS. A TLB-miss (translation look-aside buffer) causes a double page walk to perform the necessary address translation (virtual to guest physical, then guest physical to host physical) whereas without nested paging only a single page walk is necessary. As a result, you can say that frequent TLB misses – in either mode – have a negative impact on performance. The frequency at which TLB misses occur depends on the size of the TLB (the TLB caches address translations), the use of nested paging (with nested paging twice the amount of translations has to be stored) and the memory workload of the application. 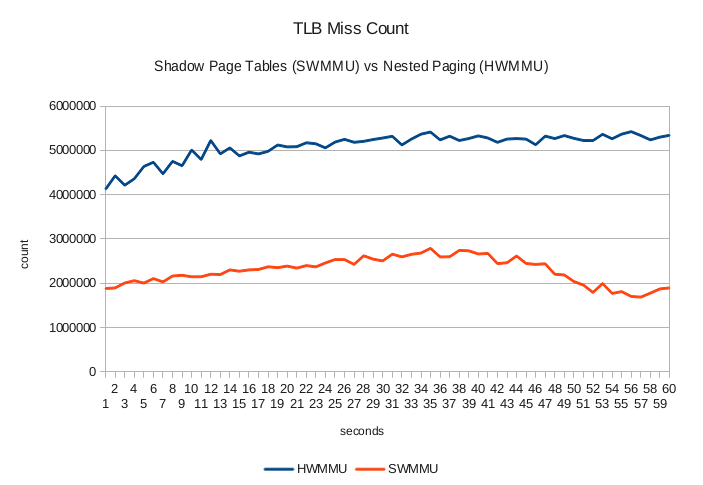 So, in order tell whether an application would be better off using shadow page tables, you have to monitor the number of TLB misses with and without nested paging and compare the results. ESXi provides a command line tool that allows us to monitor such events. It is the equivalent to the perf command on Linux systems used for exactly the same purpose. The vmkperf command is only accessible through a SSH connection to the ESXi host directly, not via vCLI or vMA. The tool allows you to monitor some pre-configured events, too, but TLB misses are not among them, so you have to manually specify the event select and unit mask for that event (taken from the documentation mentioned above). Last week I was asked about the estimated bandwidth requirement for a VMRC based console connection through a vCloud Director cell. Well, I did not know at the time, so I set up a little test environment. The results I want to share with you now. In vSphere the question for the bandwidth consumption of a vSphere Client console window is rather pointless. Unless we are talking about a ROBO (remote offices and branch offices) installation, console connections are made from within the company LAN where bandwidth is much less of an issue. 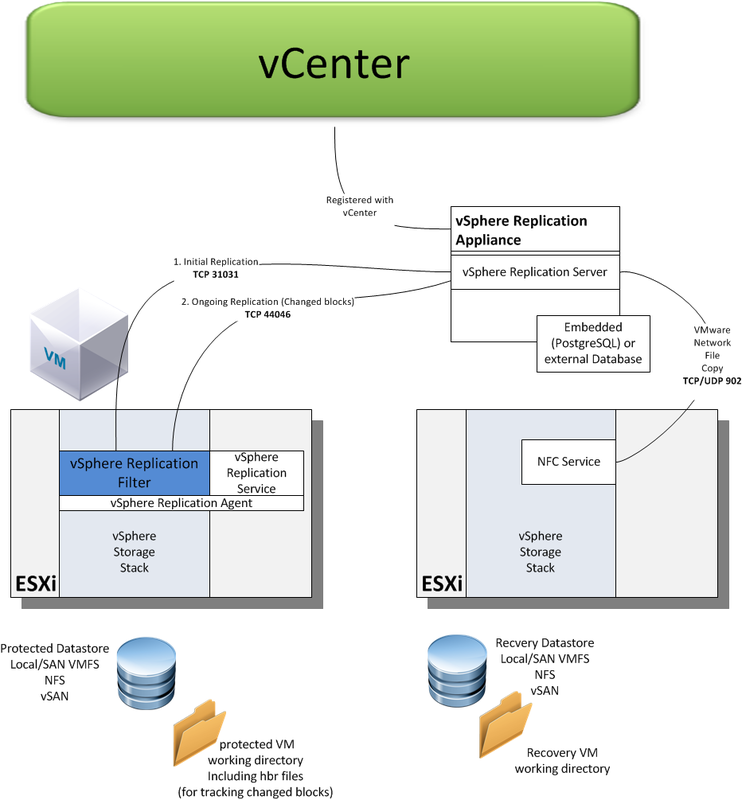 Figure 1: Remote console connection with vSphere Client. The fat dashed line indicates the connection made from vSphere Client directly to ESXi in order to pick up the image of a virtual machine’s console. With vCloud Director things are a bit different: Customers have access to a web portal and create console connections to their VMs through the VMRC (virtual machine remote console) plug-in. Though the plug-in displays the console image, the connection to ESXi is not initiated by it. Instead the VMRC connects to the vCD cell’s console proxy interface. vCD then connects to ESXi. This means a vCD cell acts as a proxy for the VMRC plug-in. Figure 2: Remote console through the vCloud Director web portal. Of course, the browser could be located inside the LAN, but especially in public cloud environments this traffic will flow through your WAN connection. Of course, the configured screen resolution and color depth has to be considered, too. But this is not going to be a big evaluation of the performance but rather an attempt to give you – and myself – an impression and rough values to work with. Figure 3: Network performance of a vCD cell during a VMRC connection. I started the testing after 8 PM, so please ignore the the spikes on the left. The first block of peaks after 8 PM is the result of writing text in notepad. I did not use a script to simulate this workload which is probably the reason why values are not very constant. Towards the end, I reached a fairly high number of keystroke per second – probably higher than what would be an average value. The estimated average bandwidth is around 1400 KBps. After that, I started a youtube video. The video was high resolution but the player window remained small. Still, I reached an average of maybe 3000 KBps! Browsing a few web sites and scrolling the browser window seems to create a slightly lower amount of network I/Os. Most likely, a realistic workload includes reading sections before scrolling, so the bandwidth consumption would be even lower than the measured average of – let’s say – 1600 KBps. As we have seen the protocol used for the VMRC connection is not a low bandwidth implementation. Implementing your cloud, you should definitely keep that in mind. A single VMRC connection does not harm anyone, but having several 10 concurrent connections might congest your WAN connection depending on what you have there. Also could a single customer influence performance of another! But this works only for connections to the same VM! A more professional solution would include the an appliance placed in front of the vCD cells that performs traffic shaping per VMRC connection. Maybe your load balancer can do this! Sitting on my sofa this morning watching Scrubs, I was thinking about the NUMA related considerations in vSphere – yes, I am a nerd. I read about this for the first time back in the days of vSphere 4.0, but it probably existed for much longer. Then it came to my mind that since vSphere 5.0 VMware supports the configuration of the number of sockets and cores per socket for a Virtual Machine and the 5.0 feature called vNUMA. I googled the topic for a while an found a bit of information here and there. I figured it was time to write a single article to completely cover the topic. Non-Uniform Memory Access (NUMA) is a computer memory design used in multiprocessing, where the memory access time depends on the memory location relative to a processor. Under NUMA, a processor can access its own local memory faster than non-local memory, that is, memory local to another processor or memory shared between processors. 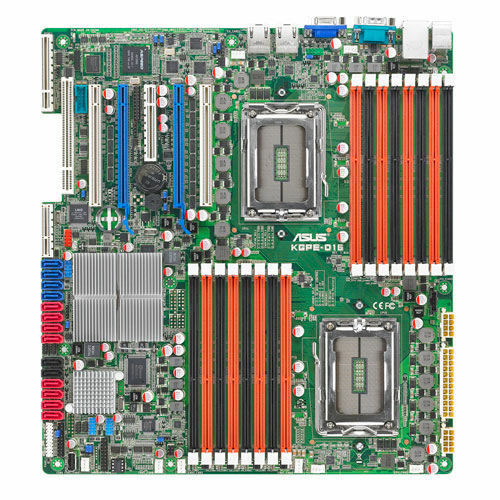 This means in a physical server with two or more sockets on an Intel Nehalem or AMD Opteron platform, very often we find memory that is local to one and memory that is local to the other socket. A socket, its local memory and the bus connecting the two components is called a NUMA node. Both sockets are connected to the other sockets’ memory allowing remote access. Please be aware that an additional socket in a system does NOT necessarily mean an additional NUMA node! Two or more sockets can be connected to memory with no distinction between local and remote. In this case, and in the case where we have only a single socket, we have a UMA (uniform memory access) architecture. UMA system: one or more sockets connected to the same RAM. Whenever we virtualize complete operating systems, we get two levels of where scheduling takes place: A VM is provided with vCPUs (virtual CPUs) for execution and the hypervisor has to schedule those vCPUs accross pCPUs (physical CPUs). On top of this, the guest scheduler distributes execution time on vCPUs to processes and threads. So, we have to take a look at scheduling at two different levels to understand what is going on there. But before we go into more detail we have to take a look at a problem that might arise in NUMA systems. Each NUMA node has its own computing power (the cores on the socket) and a dedicated amount of memory assigned to that node. You can very often even see that taking a look at your mainboard. You will see two sockets and two separate groups of memory slots. Those two sockets are connected to their local memory through a memory bus, but they can also access the other socket’s memory via an interconnect. AMD calls that interconnect HyperTransport which is the equivalent to Intel’s QPI (QuickPath Interconnect) technology. The names both suggest very high throughput and low latency. Well, that’s true, but compared to the local memory bus connection they are still far behind. What does this mean to us? 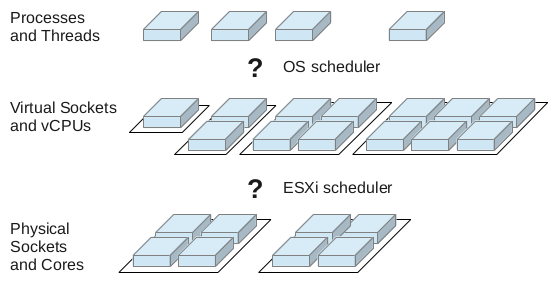 A process or virtual machine that was started on either of the two nodes should not be moved to a different node by the scheduler. If that happened – and it can happen if the scheduler in NUMA-unware – the process or VM would have to access its memory through the NUMA node interconnect resulting in higher memory latency. For memory intensive workloads, this can seriously influence performance of applications! This is referred to by the term “NUMA locality”. ESX and ESXi servers are NUMA-aware for a while now – to be exact since version 3.5. NUMA-awareness means the scheduler is aware of the NUMA topology: the number of NUMA nodes, number of sockets per node, the number of cores per socket and the amount of memory local to a single NUMA node. The scheduler will try to avoid issues with NUMA locality. To do that, ESXi will make an initial placement decision to assign a starting VM to a NUMA node. From now on, the VM’s vCPUs are load balanced dynamically across cores on that same socket. In this example, VMs A and B were assigned to NUMA node 1 having to share cores on that socket. VM C is scheduled on a different node, so that VMs A and B will not have to share cores with VM C. In the case of very high load on either socket, ESXi can decide to migrate a VM from one NUMA node to another. But that’s not going to happen recklessly as the price for that is very high: To avoid NUMA locality problems after the migration, ESXi will migrate the VM’s memory image, too. That puts high load on the memory bus and the interconnect and could influence the overall performance on that host. But if perceived benefits outreach costs, that is going to happen. In the figure above, the VMs are “small” meaning they have less vCPUs than the number of cores per NUMA node and less memory than what is local to a single NUMA node. Thing start to become interesting for VMs with more vCPUs than the number of cores on a single socket. The hypervisor scheduler would have to have that VM span multiple NUMA nodes. A VM like this will not be handled by the NUMA scheduler anymore – so no home node will be assigned. As a result, the VM’s vCPUs will not be restricted to one or two NUMA nodes but can be scheduled anywhere on the system. Memory will be allocated from all NUMA nodes in a round-robin fashion. Like that, memory access latencies will dramatically increase. 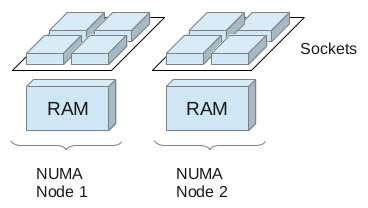 Figure 5: A large VM spannung two NUMA nodes. To avoid this, it is the administrators job to make sure every VM fits into a single NUMA node. This includes the number of vCPUs and the amount of memory allocated to this VM. Introduced in vSphere 4.1 the concept of a “Wide-VM” addresses the issue of memory locality for virtual machines larger than a single NUMA node. The VM is split into two or more NUMA clients which are then treated as if they were separate VMs handled by theNUMA scheduler. That means, each NUMA client will be assigned its own home node and be limited to the pCPUs on that node. 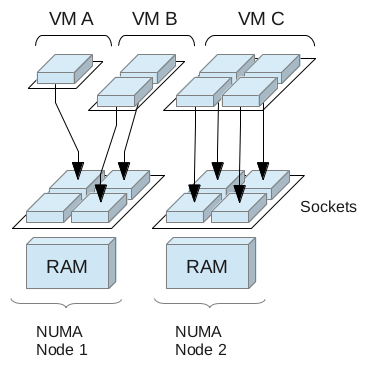 Memory will be allocated from the NUMA nodes the VM’s NUMA clients are assigned to. This improves the locality issue and enhances performance for Wide-VMs. A technical white paper provided by VMware goes into more detail on how big the performance impact really is. As a result, chances of remote access and high latencies are decreased. But this is not the final solution because operating systems are still unaware of what is happening down there. Before vSphere 5.0, the NUMA topology was unknown to the guest OS. The scheduler inside the guest OS was not aware of the number of NUMA nodes, their associated local memory or the number of cores contained by the socket. From the OS’s perspective, all available vCPUs were seen as being their own sockets, all memory can be accessed from all sockets in the same speed. Due to this unawareness, a scheduling decision made by the OS could suddenly render a well-performing process suffering from bad memory locality after is was moved from one vCPU to another. In figure 5, the VM spans two NUMA nodes with 4 vCPUs on one and 2 vCPUs on the other node. The OS sees 6 single-core sockets and treats them all as scheduling targets of equal quality for any running process. But actually, scheduling a process from the very left vCPU to the very right vCPU migrates the process from one physical NUMA node to another. If the number of cores per socket (cpuid.coresPerSocket) is greater than one, and the number of virtual cores in the virtual machine is greater than 8, the virtual NUMA node size matches the virtual socket size. root@vnumademo:~# cat /proc/cpuinfo | grep "physical id"
The numactl tool shows only a single NUMA node – I configured 2 virtual sockets in vSphere Client, remember? Well, sockets doesn’t necessarily mean NUMA node (see above). From the OS’s perspective, this is a UMA system with 2 sockets. As explained above, vNUMA kicks in from 9 vCPUs. To reduce that threshold to some lower number, configure the numa.vcpu.maxPerVirtualNode advanced setting for that VM. This setting defaults to 4 (as it is per virtual node). Configure a VM with less vCPUs than the number of physical cores per socket. Configure a VM with less memory than what is local to a single physical NUMA node. Configure a VM with more vCPUs than the number of physical cores per socket is a bit less of a problem but there is still a chance of remote accesses. 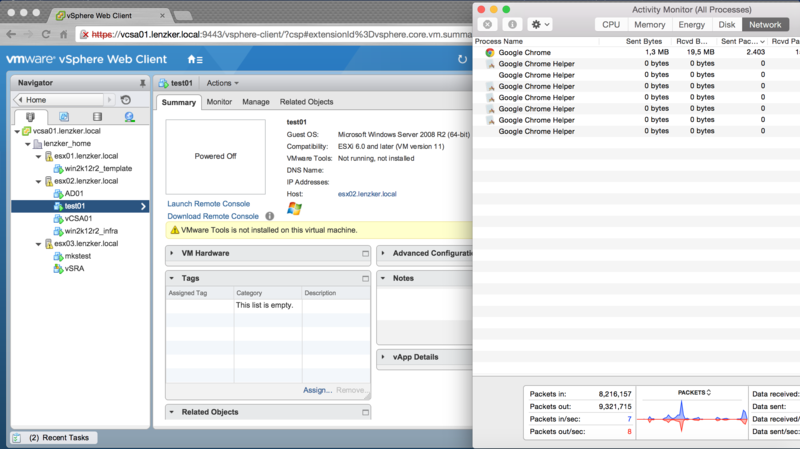 Configuring 8 or less vCPUs for a VM does not change much compared to vSphere 4.1. Assigning more than 8 vCPUs to a VM spread across multiple sockets create virtual NUMA nodes inside the guest allowing for better scheduling decisions in the guest. For every version of vSphere, please note that the whole issue of memory latency might not even apply to your VM! For VMs with low memory workloads the whole question might be irrelevant as the performance loss is so minimal.